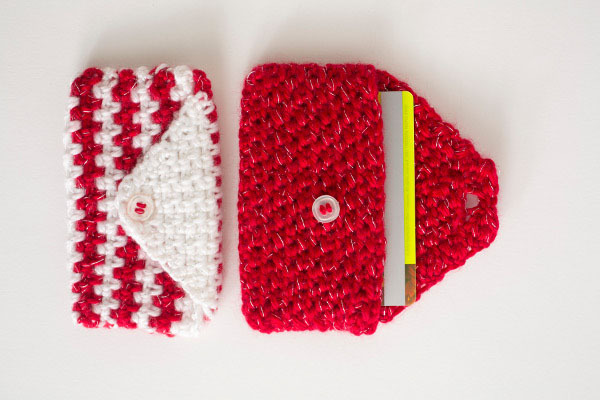 Personalize your holiday gift cards with 12 different cozies. The metallic thread in the yarn adds a great sparkle. 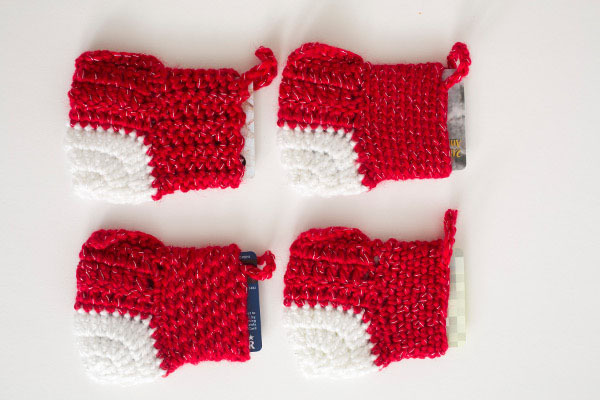 These quick and simple gift card cozies are wonderful wrapping for last minute gifts, to make as stash busters, or to add a DIY touch to a mass produced gift. Invisible Single Crochet Decrease (invdec): (Insert hook in front loop of next st) twice, yo and draw up a loop, yo and draw through 2 loops. Slip Stitch 2 Stitches Together (slst2tog): (Insert hook in back loop of next st) twice, yo and draw through all 3 loops. Row 1: Turn, ch 1, *sl st, hdc; rep from * across to last st, sl st.
Row 2: Turn, ch 1, *hdc, sl st; rep from * across to last st, hdc. Row 1: Turn, ch 1, scBL in same st and in ea st across. Row 1: Turn, ch 2 (counts as hdc), *(sc, ch 2, sc) in next ch-2 sp; rep from * across to last st, hdc in t-ch. Row 1: Turn, ch 1, sc in same st and in ch-1 sp, *ch 1, sk 1, sc in ch-1 sp; rep from * across to last st, sc. Row 2: Turn, ch 1, sc in same st, *ch 1, sk 1, sc in ch-1 sp; rep from * across. Always change colors on the last yo of final stitch of row, or with sl st when joining in the round. Carry colors up edge or inside as you work; do not fasten off. Foundation Row: Turn, skip first ch, hdc, *sl st, hdc; rep from * across. Rows 1-23: Rep Rows 1-2 in Crunch Stitch pattern, ending on Row 1. Row 24: Turn, ch 1, dc2tog, *hdc, sl st; rep from * across to last 3 sts, hdc, dc2tog. Row 25: Turn, ch 1, slst2tog, *hdc, sl st; rep from * across to last 3 sts, hdc, slst2tog. Rows 26-29: Rep Rows 24-25 twice more. Row 30: Rep Row 24. Row 31: Turn, ch 1, slst2tog, hdc, sl st, ch 2, skip 3 sts, sl st, hdc, slst2tog. Row 32: Turn, ch 1, dc2tog, hdc, sl st in ea of next 2 ch, hdc, dc2tog. Fasten off. Fold along Row 12 and follow finishing instructions. Foundation Row: Turn, skip 1 ch, sc in next and in each st across. Rows 1-28: Rep Row 1 in Ridge Stitch pattern. Row 29: Turn, ch 1, invdecBL, scBL to last 2 sts, invdecBL. Rows 30-34: Rep Row 29. Row 35: Turn, ch 1, invdecBL, scBL twice, ch 2, skip 3 sts, scBL twice, invdecBL. Row 36: Turn, ch 1, invdecBL, scBL in next 4 sts, invdecBL. Fasten off. Fold along Row 14 and follow finishing instructions. Foundation Row: Turn, skip 3 ch, (sc, ch 2, sc) in next ch, *sk next 2 sts, (sc, ch 2, sc) in next st; rep from * across to last 2 ch, sk 1 ch, hdc. Row 1: Rep Row 1 in V-Stitch pattern, change to CB. 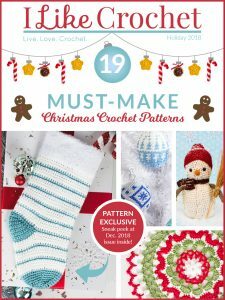 Row 2: Rep Row 1 in V-Stitch pattern. Row 3: Rep Row 1 in V-Stitch pattern, change to CA. Rows 5-16: Rep Rows 1-4. Rows 17-18: Rep Rows 1-2, fasten off CA. Row 19: Rep Row 2, fasten off. Row 20: Join CA with sl st to unworked edge of foundation ch, ch 1, sc in same, work 22 more sc across row evenly. Rows 21-28: Rep Rows 29-36 of Ridge St version. Fasten off. 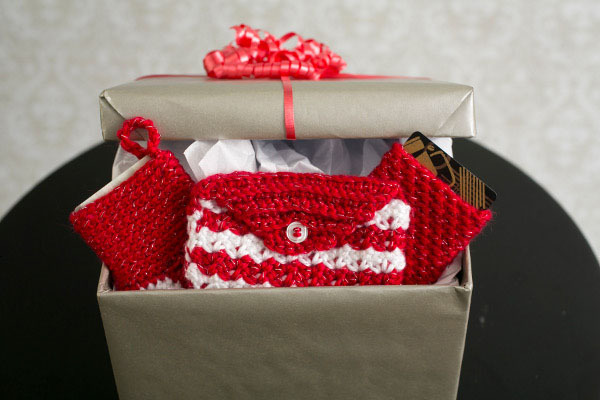 Fold along Row 9 and follow finishing instructions. Foundation Row: Turn, skip first ch, sc, *ch 1, skip 1, sc; rep from * across. Row 1: Rep Row 1 in Woven Stitch pattern, change to CA. Row 2: Rep Row 2 in Woven Stitch pattern. Row 3: Rep Row 1 in Woven Stitch pattern, change to CB. Row 4: Rep Row 2 in Woven Stitch pattern. Rows 5-28: Rep Rows 1-4, fasten off CA. Row 29: Turn, invdec, * sc in ch-1 sp, ch 1, skip 1; rep from * across to last 3 sts, sc in ch-1 sp, invdec. Rows 30-35: Rep Row 29. Row 36: Turn, invdec, sc in ch-1 sp, ch 2, sk next ch 1 sp, sc in next ch-1 sp, invdec. Row 37: Turn, invdec, sc in each of next 2 ch, invdec. Fasten off. Rnd 1: Turn, skip 1, 2 sc in next ch, sc in each ch across to last, 2 sc in last ch, turn and work along unworked side of foundation ch, sc in each ch across, place marker, begin working in spirals without joining. Rnd 2: *HdcBL, slstBL; rep from * around to last st, hdcBL. Rnd 3: *SlstBL, hdcBL; rep from * around to last st, slstBL. Rnds 4-17: Rep Rounds 2-3. Rnd 18: Rep Round 2, slslBL in next st. Fasten off. Rnd 1: Turn, skip 1, 3 sc in next ch, sc in each ch across to last, 2 sc in last ch, turn and work along unworked side of foundation ch, sc in each ch across, place marker, begin working in spirals without joining. Rnds 2-17: ScBL in each st around. Rnd 18: Rep Round 2. Fasten off. With CB, ch 14. Repeat through Round 1 of Ridge Stitch sleeve cozy. Rnd 2: *Skip 2 sts,** (sc, ch 2, sc) in next st; rep from * around, ending last rep at **. Rnd 3: (Sc, ch 2, sc) in each ch-2 sp around. Rnds 4-14: Rep Round 3. Rnd 15: Rep Round 2, join with sl st to next ch-2 sp. Fasten off. With CA, ch 14. Repeat through Round 1 of Crunch Stitch sleeve cozy. Rnd 2: *Ch 1, skip 1 st,** sc in next st; rep from * around, ending last rep at **. Rnd 3: *Sc in ch-1 sp,** ch 1, skip 1 st; rep from * around, ending last rep at **. Rnd 18: Rep Round 2, join with sl st to next ch-1 sp. Fasten off. With CB, ch 4, join with sl st to first ch to form ring. Rnd 1: Ch 3 (counts as first dc), 7 dc in ring, join with sl st to first dc. Rnd 2: Ch 3, dc in same st, 2 dc in each st around, join with sl st to first dc. Rnd 3: Ch 3, dc in same and next st, *2 dc in next st, dc in next st; rep from * around, change to CB when joining with sl st to first dc. Rnd 4: Ch 1, sc in same st and in each st around, join with sl st to first sc. Rnd 5: Turn, ch 3, dc in each of next 13 sts. Rnds 6-7: Rep Round 5. Rnd 8: Turn, fold across Round 7 edges, line up stitches, ch 1, sc in each st across, working through both sides of Round 7. Rnd 9: Turn, ch 1, sc in each st of Round 8, place marker and begin working around, work 27 sc evenly around edges of Rounds 5-7 and remaining unworked sts from Round 4. 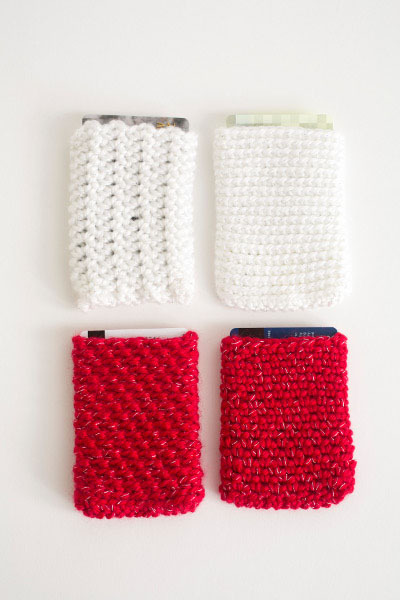 Rep Rounds 2-3 as for sleeve style cozies 4 times. Rep Round 2 as for sleeve style cozy 9 times. Final Round: Follow Round 2 pattern as for sleeve style cozies for next 24 sts, ch 12, sk 3 sts, join with sl st. Fasten off. Rep Round 2 as for sleeve style cozy. Rep Round 3 as for sleeve style cozy 7 times. Final Round: Follow Round 3 as for sleeve style cozy, ch 12, join with sl st to first ch-2 sp. Fasten off. Fold as instructed in pattern. With yarn threaded through yarn needle, seam short edges together with whip stitch. Fold over shaped edge to position button. Sew on button with CA and yarn needle. With yarn needle, weave in ends on inside. With yarn needle, weave in ends on inside.